Four star Plaza Mayor Hotel is just 50 minutes from Buenos Aires and 178 kilometers (110 miles) from the capital of Uruguay (Montevideo). 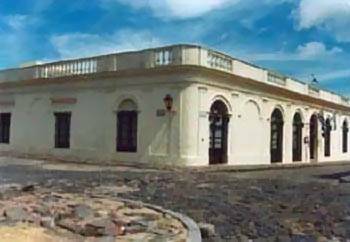 This charming hotel, originally part of a Portuguese ranch house built in 1860, is located in the historical part of The Old City of Colonia del Sacramento, declared a World Heritage zone by UNESCO. You can see the Platte River from the hotel. There's also a wonderful promenade inviting you to walk and enjoy the magnificent views. The hotel itself has an interior flowered garden with a beautiful fountain, reminiscent of colonial Spanish courtyards. The Plaza Mayor Hotel has 15 rooms: 12 on the first floor with the original walls and high ceilings, and three rooms on the second floor decorated in a modern style. Hotel amenities include: 24-hour room service, laundry, snack-bar, emergency medical service, business services for fax and email, satellite television in the lobby, wireless internet, gym, private parking and complimentary coffee or tea. Room amenities include: Private bathroom, air-conditioning, minibar, international direct-dial telephone, hair dryer and satellite television. Nearby attractions within 1500 feet include historical churches, a museum, art gallery, and shopping, making Plaza Mayor Hotel an ideal, convenient accommodation while visiting charming Colonia.